All models offer rapid steam raising, with fast energy transfer and reduced radiation losses. 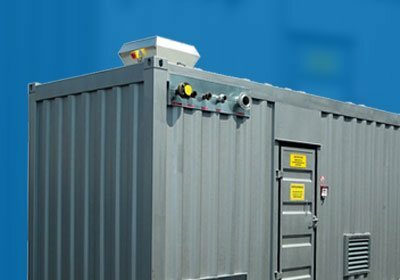 Manufactured with a compact space saving design, our electric units are ideal for low demand applications. Designed to reduce site install costs and to offer a compact solution to the standard plant room installation. Certuss containerised package plant modules available fully equipped, to meet customer requirements. 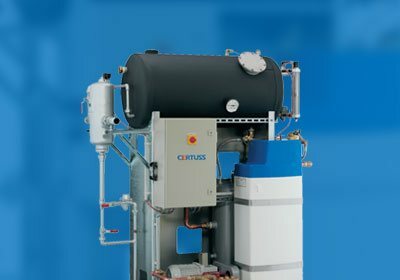 If you are looking for rapid steam raising boiler equipment, highly efficient, with flexible adjustment to suit load varients and safe to use, then CERTUSS can accomodate your needs. 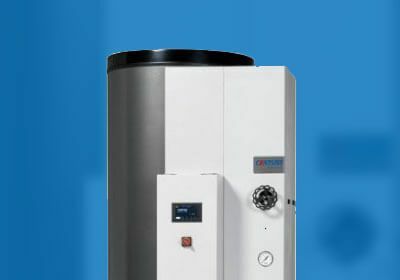 We can cater for single steam generator requirements with steam outputs from 8 kg/h (6 kW) up to 2000 kg/h (1312 kW) or multiple steam boiler plants up to 10,000 kg/h (6560 kW). With a triple outer casing construction, offering a patented air circulation and pre-heated combustion feature, the CERTUSS Steam Generator delivers a high level thermal efficiency of > 93 % as a standard. When Hans Joachim Schroder founded CERTUSS in Krefeld, Germany in 1957 he didn’t choose the company name without careful consideration. His vision was to create compact, quiet and reliable steam generators like no one had before. Therefore he chose a name that fits the company product he envisioned. CERTUSS. In Latin CERTUSS means safe and reliable. CERTUSS is not only our company’s name but it is a description of our products as well. 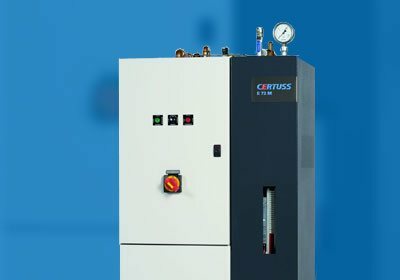 CERTUSS Steam Generators can be placed in the working area and don’t require any boiler housing. Even when in full operation, the outside of a CERTUSS Generator is never hot, but only mildly warm. The proof of our reliability is simple: we keep spare parts stored for over 20 years due to the long life span of our generators. If you should have any questions concerning your CERTUSS Generator you can rely on us to help you immediately. When Hans Joachim Schroder founded CERTUSS in Krefeld, Germany in 1957 he didn’t choose the company name without careful consideration. His vision was to create compact, quiet and reliable steam generators like no one had before. Therefore he chose a name that fits the company’s product he envisioned. CERTUSS. In Latin CERTUSS means safe and reliable. CERTUSS is not only our company’s name but it is a description of our products as well.